Objective of the study To determine the extent and nature of unlicensed/off-label prescribing patterns in hospitalised children in Palestine. Setting Four paediatric wards in two public health system hospitals in Palestine [Caritas children’s hospital (Medical and neonatal intensive care units) and Rafidia general hospital (Medical and surgical units)]. Method A prospective survey of drugs administered to infants and children <18 years old was carried out over a five-week period in the four paediatric wards. Main outcome measure Drug-licensing status of all prescriptions was determined according to the Palestinian Registered Product List and the Physician’s Desk Reference. Results Overall, 917 drug prescriptions were administered to 387children. Of all drug prescriptions, 528 (57.5%) were licensed for use in children; 65 (7.1%) were unlicensed; and 324 (35.3%) were used off-label. Of all children, 49.6% received off-label prescriptions, 10.1% received unlicensed medications and 8.2% received both. Seventy-two percent of off-label drugs and 66% of unlicensed drugs were prescribed for children <2 years. Multivariate analysis showed that patients who were admitted to the neonatal intensive care unit and infants aged 0–1 years were most likely to receive a greater number of off-label or unlicensed medications (OR 1.80; 95% CI 1.03–3.59 and OR 1.99; 95% CI 0.88–3.73, respectively). Conclusion The present findings confirmed the elevated prevalence of unlicensed and off-label paediatric drugs use in Palestine and strongly support the need to perform well designed clinical studies in children. The authors wish to thank Dr Chris Cardwell, Department of Epidemiology and Public Health, Queen’s University Belfast, for his statistical support, Nursing & administrative staff at the Caritas and Rafidia hospitals. The Daniel Turnberg UK/Middle East Travel Fellowship for financial support is acknowledged. Royal College of Paediatrics and Child Health. The use of unlicensed medicines or licensed medicines for unlicensed applications in paediatric practice [Internet]. London: Royal College of Paediatrics and Child Health; 2002 [cited 2011 Jan 21]. Available from: www.rcpch.ac.uk/doc.aspx?id_Resource=7581. State of Palestine Ministry of Health. Palestinian essential drug list [Internet]. Nablus: Ministry of Health; 2006 [cited 2011 Jan 21]. 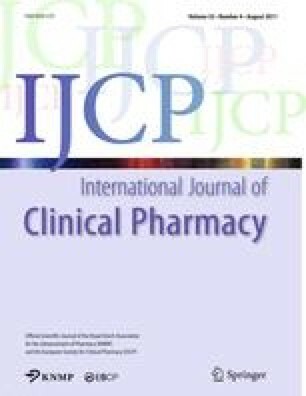 Available from: http://pharmacy.moh.ps/index.php. World Health Organization. The International statistical classification of diseases and related health problems (ICD), 10th Revision [Internet]. Geneva: WHO & DIMDI; 2006 [updated 2007; cited 2011 Jan 21]. Available from: http://apps.who.int/classifications/apps/icd/icd10online/. The European agency for the evaluation of medicinal products (EMEA). Medicines for children: the paediatric regulation [Internet]. Strasbourg: EMEA; 2006 [cited 2011 Jan 21]. Available from: http://ec.europa.eu/health/files/eudralex/vol‐1/reg_2006_1901/reg_2006_1901_en.pdf.